Portsmouth International Port, owned by Portsmouth City Council, first opened in 1976 and has continued to grow and develop ever since. The port serves ferries and cruise ships and is the second largest passenger ferry terminal in the UK, carrying approximately 2.2 million passengers per year only the port of Dover handles more. Ferry services from Portsmouth serve the following destinations Bilbao (Spain), Caen (France), Cherbourg (France), Guernsey (Channel Islands), Jersey (Channel Islands), Le Havre (France), Santander (Spain) and St Malo (France). 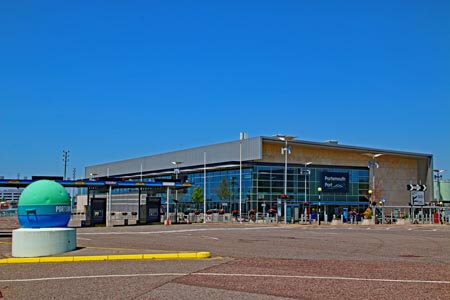 Portsmouth Port is easily accessible from the motorway network, there is a dedicated exit from the port onto M275, giving excellent access to the M27, M3, A34, M4 and A3(M) via the Hindhead tunnel. Cutting edge environmental features have been incorporated into the terminal building, it is the first public building in the country to use a sea water-source heat pump system using energy from the sea to heat and cool the building. Sea water is also used to flush the toilets helping to reduce the fresh water consumption. Windcatchers are built into the roof to provide natural ventilation of the buildings interior. A 24-hour, multi-storey car park at Portsmouth Continental Ferry Port provides 516 passenger parking spaces. The pay-on-foot facility is well lit and incorporates the latest automated parking technology and CCTV cameras. National Express coach services drop off and pick up in the Ferry Port. Rail services via Portsmouth and Southsea Station can be reached from the Port either by shuttle bus which operates in peak season, or by taxi or minibus. We respect your right to the privacy of your personal information: this information will be used solely for the purpose of providing feedback from you about the Welcome to Portsmouth site. We will never release your personal information to a third party and will never send unsolicited email communications.